Red Stag (Cervus elaphus)Appearance: The Red stag is a majestic deer with large, impressive antlers. They develop a neck mane during the April rut. Weight: 135-160 kgs (300-350 lbs). Antlers: A good set of antlers will have six points or more on either side. 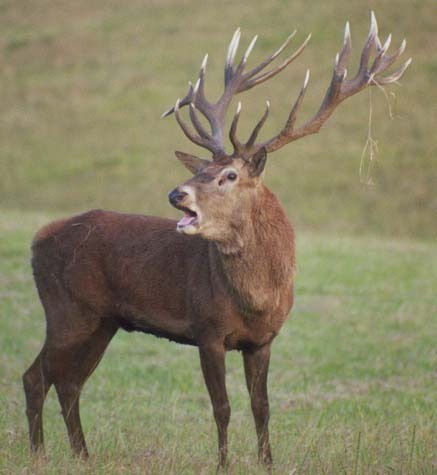 Trophy size: The dominant blood-line of the red stag in Queensland is from Scotland. 5 or 6 points per side is considered a good trophy. History: Animals originating from England and Scotland were released throughout Australia. The first release was in 1860. Hunting Red stag in Australia: During the rut they will ‘roar’, wallow and fight aggressively to attract a harem of females and chase off rivals. This is a good time to hunt them as they can be located and even called in. They typically prefer light forested terrain that gives cover and visibility. They prefer flight to hiding. Spotting is done across valleys and stalks can be longer than with other species.